The networks began their holiday. CBS: On the only network to offer a full regular line-up, SURVIVOR took a 0.3 hit to 1.4, while SEAL TEAM (1.1) and CRIMINAL MINDS (1.0) were steady. ABC: A CHARLIE BROWN THANKSGIVING fell 0.3 from last year’s airing to 1.7. It was followed by 1.2/0.8 sitcom reruns, and then the special LIGHTS, CAMERAS, CHRISTMAS was at 0.8, the same as last week’s DESIGNATED SURVIVOR. 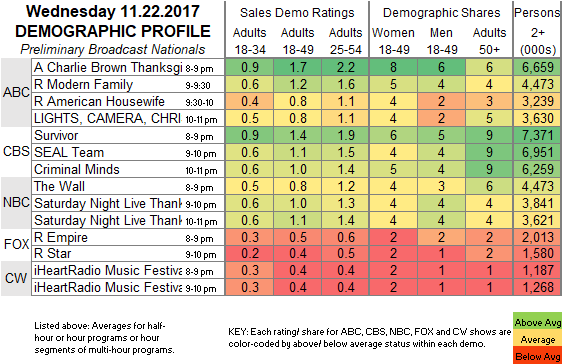 NBC: A special episode of THE WALL at 0.8 was followed by an SNL THANKSGIVING clip show at 1.0, which was down 0.6 from last year’s SNL holiday special. CW: Another IHEARTRADIO MUSIC FESTIVAL special (which concludes on Friday) was at 0.4. 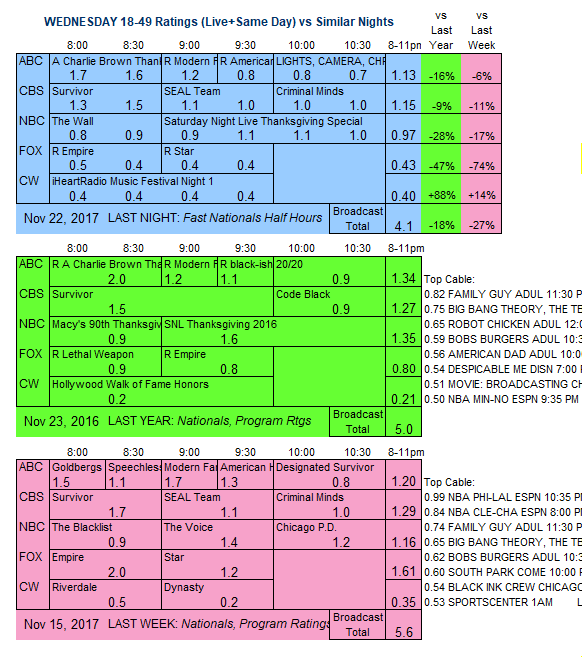 The holiday schedules continue tonight, with CBS once again as the exception (although BIG BANG THEORY is a rerun), and with NBC’s THURSDAY NIGHT FOOTBALL ending the annual tripleheader. CABLE RATINGS: Come back Monday afternoon for detailed demographic ratings for top cable programs from this day, later than usual due to the Thanksgiving holiday weekend.